Former Marvel Comics Editor Andy Schmidt Returns to Super-Human Comics with Achilles Inc., But You Won’t Find Many Heroes! New comic book mini-series from Comics Experience and Source Point Press on sale April 2019! Comics Experience and Source Point Press are excited to announce that their new four-issue comic book miniseries, Achilles Inc., goes on sale at retailers across the world on April 24th! 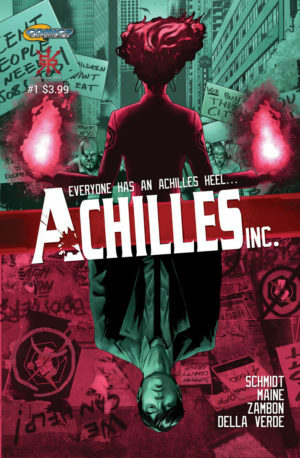 Achilles Inc. explores what happens when the people who get superpowers don’t put them to good use. With writing by Andy Schmidtand art by Daniel Maine, Francesca Zambon, and Marco Della Verde,Achilles Inc. delves into a world where superpowered people have used their abilities for personal gain, exploiting humanity and tanking the world economy — unemployment runs high and hopes run low for the world’s disenfranchised. In the midst of this crisis, Ransom Yeong, an ex-cop, steps right into the middle of a class war between the “Boosters” and the “Duds.” But he’s not alone in his crusade as he finds Kyra, a talented attorney, Mishy, his sharp-tongued administrative assistant and Dani, a booster with electricity-control abilities, all of whom feel powerless in the new world order. Together, they craft a plan to take advantage of their oppressors’ weaknesses and restore freedom to the world. All four issues of Achilles Inc. are available via Diamond’s Previews catalog from Source Point Press — order code FEB191968 — and the first issue of four will be available at retail on April 24th. It is also available at Source Point’s convention appearances and their online store, as well as digitally on comiXology. The Final Order Cut Off Date (FOC) is February 18th.